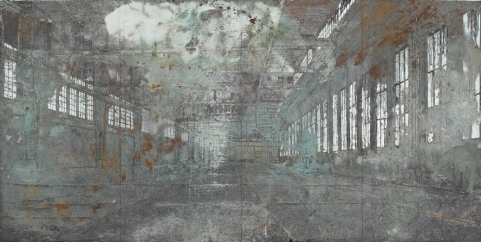 There is something extraordinary about Anselm Kiefer’s paintings. The surfaces aren’t quite like anyone else’s and the scale of the work means that standing before one I always feel part of the picture space. The paintings in Kiefer’s exhibition Il Mistero delle Cattedrali at White Cube Bermondsey are less heavily textured than some of his work but the surfaces are still rough and often salty. The galleries are big – few commercial galleries could accommodate work on this scale – but even so the largest work on show comes as a surprise. There are several very big paintings here – there are four works of 3.3m by 7.6m – but there is one whose scale is utterly overwhelming at 3.3m by 17.1m (yes, that would be a painting more than 17m wide). Of course, size isn’t everything. It would be perfectly possible to make a painting on this scale that left the viewer wondering quite why one had bothered but this is different. The space in the picture is industrial and the painting puts us right there. The white walls of the gallery space disappear from view. The theme of alchemy runs through this exhibition and in particular Fulcanelli’s claim in his 1926 book Il Mistero delle Cattedrali (from which the exhibition takes its name) that the gothic cathedrals of Europe displayed codes of alchemy. Kiefer’s work perhaps displays an alchemy of its own, given his ability to hold me rapt in front of his work. I don’t think I’ve ever seen a Kiefer painting that didn’t leave me somewhat awestruck – and there is a lot in this show, both painting and sculpture, that does just that – but in front of Dat rosa miel apibus in particular that response is writ large. This entry was posted in Painting, Sculpture and tagged Anselm Kiefer, art, Il Mistero delle Cattedrali, painting, sculpture, White Cube by Ann Jones. Bookmark the permalink.